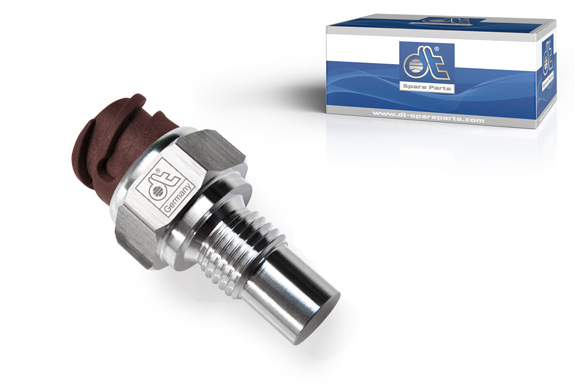 Temperature sensors are used in modern commercial vehicles for multifarious applications, e.g. thermal management in engine control, temperature-controlled diesel preheating, control of the vehicle air conditioning, automatic mirror heating, control of the seat heater, temperature control of the cooling box, monitoring of the cargo …etc. DT® brand temperature sensors meet the high quality and safety standards of the motor industry. This allows a sustainable function under all operating conditions. An extremely stable aluminium case with thick walls reduces the risk of damage due to excessively high torque. The threads are of high precision and correspond exactly to the tolerance class 6g. To ensure a reliable contact, the connectors of the sensors are locked in by a bayonet nut connector. This provides an effective protection against moisture and dirt. The shock-resistant cast-mount circuitry (Surface Mounted Devices) is on a particularly temperature-stable board with a complete evaluation circuit. This results in a temperature-dependent resistance, surge protection and signal amplification. Through the use of small and light components, which are automatically connected to a high-tensile circuit board with a special solder, a high shock resistance to motor vibration is achieved. Larger components are additionally stabilised by a non-conductive, sufficiently flexible sealing compound (casting) and thus protected against shocks. Furthermore, the DT® brand sensors are RoHS compliant, they contain no forbidden substances, such as lead (Pb), quicksilver (Hg), hexavalent chromium (CrVI), cadmium (Cd) or environmentally hazardous plastics (PBB & PBDE). The sensors cover a wide area of application from –40 °C to +150 °C and therefore withstand even extreme ambient temperatures.